Despite Lee being away at the Edinburgh Fringe Festival we had a good session in The Lab on Thursday afternoon. Alex and Sara helped us to develop the ‘missing scene’ which we still needed to work on. The missing scene, as we have been referring to it, shows Maggie letting her hair down for the first time in her life. We also had a group discussion about what music we might use throughout the piece. To warm up and help us get in the mind-set of Maggie at the point of letting her hair down Alex played some chart pop music over the sound system and instructed us to move to it in whatever way felt natural. It was not exactly dancing but it was an exercise to help us get comfortable with moving and doing our movements on a large, exaggerated scale which is what we need to do when performing on stage. Things on stage often need to be magnified or slowed down so the audience watching can clearly see what we are doing. If we do an action in a larger way than usual we can be described as doing it on a level 5, usually then taking it up to a level 8. However, it may feel uncomfortable at first but for it really work in a performance we often need to do things on a level 10. Following our warm up we then got into three groups, all looking at different aspects of what Maggie does on her wild, carefree, selfish spending spree. During this section of the performance we see her transform from a subdued, inhibited housewife to a rampant pleasure seeking animal with no feelings of modesty or self-restraint. She becomes the life and soul of the party. She decides to live her life on level 11, i.e. off the scale. 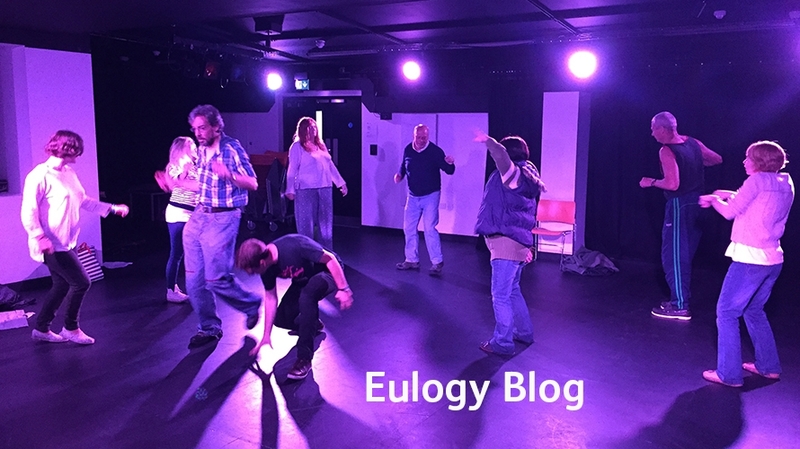 During the session we also met up with Hugh who is the Production Manager for Eulogy. Hugh and Lesley-Ann had just been to Hamoaze House to check out the performance space and make some plans regarding blacking out the windows etc. 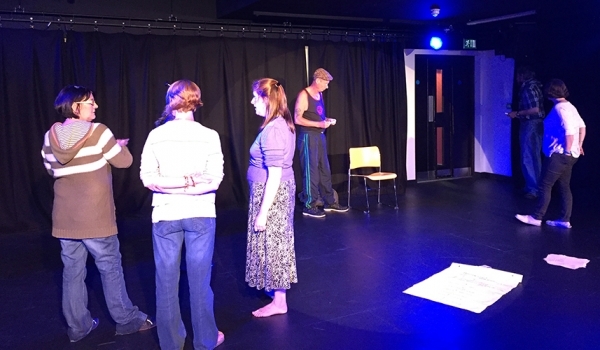 The group spoke to Hugh about the piece to give him a bit of context and clearer understanding of the play, he was interested to find out where our skills lied off stage as well as on, as the group will very much be involved in all aspects of the performance. On Thursday we will continue with rehearsals and exploring the wilder side of Maggie, along with taking a look in the costume and props store. Lots of fun to be had and more progress to be made before the return of our director.